When do you want the tournament to take place? I can make it on any of these days! 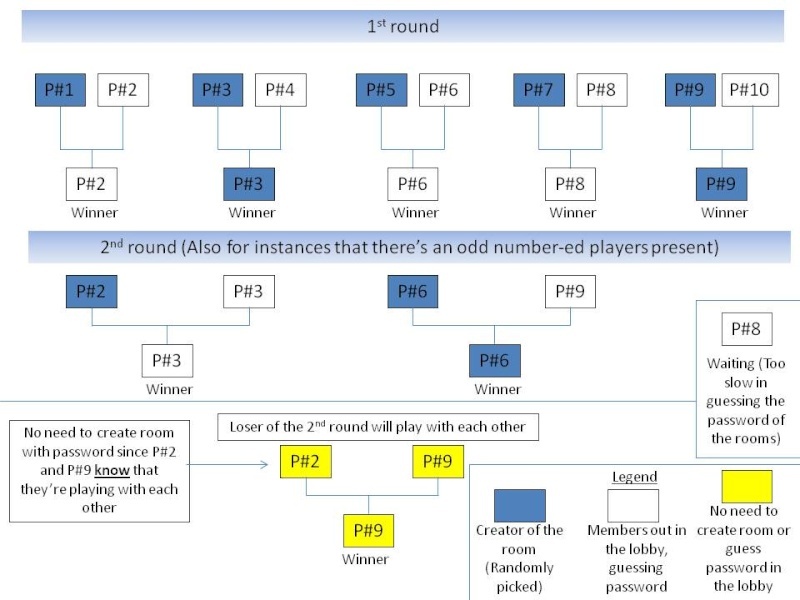 Pls vote on top for the day that you wish to have this tournament! There will be a Guild PVP Tournament this week. GWC Style. 1v1 matches! I'm here to explain what will be going on, on that day for the tournament. The room password will be unknown to all members, but the room title must be the clue to the password set by the member in the room. This ensures that no one knows who they will be fighting with whom, whether or not, in the room or out in the lobby. Thus, nobody can choose the opponent they want to PVP. Note to all members whom will create the room: The password you've typed MUST be non-capital! And so, all of the 1v1 matches will be like this for all next few rounds. Note: This chart is just an illustration. All the winners and losers in the chart are all made-up. 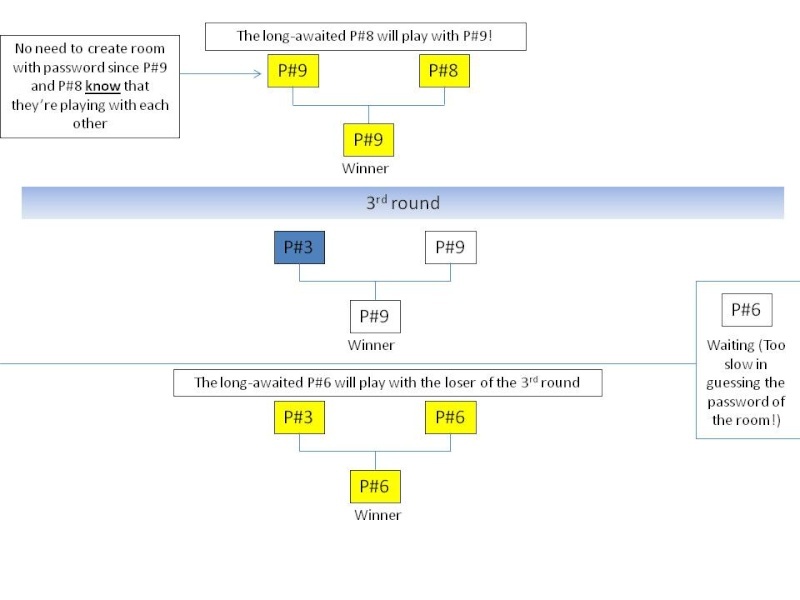 Ok, about the 3rd round, IF P#3 wins P#6, then there's no need for 4th round since P#3 had already lost to P#9. 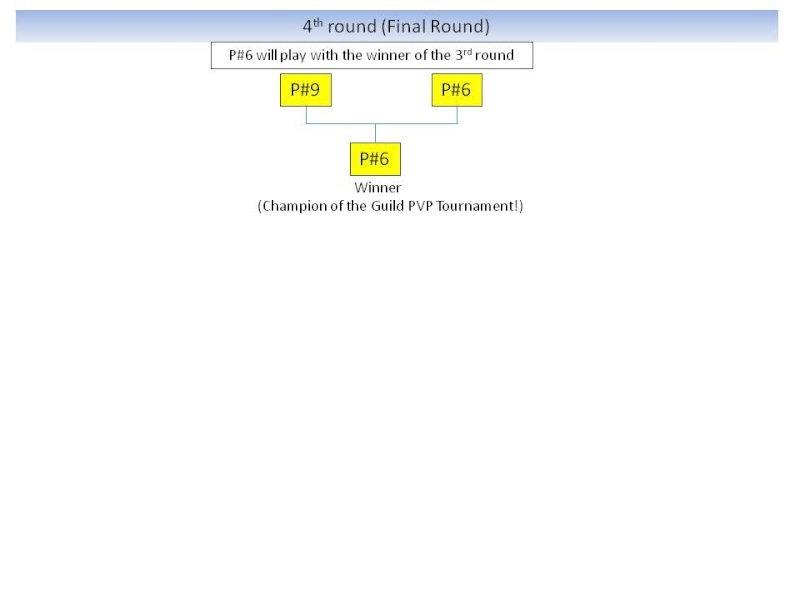 So, in that case, P#9 will be the champion of the Guild PVP Tournament ~! I guess that's about it. I will edit more if need to. Look forward to this tournament! Ta-ta! Ok. It will be this friday, which is tomorrow. Time will be 4p.m.! hope i can make it thanks for this server lol. got any prize not? this tournament is so successful. lets do gwc 3v3 next.